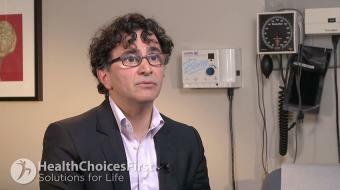 John Wade, MD, FRCPC, discusses gout treatment options. 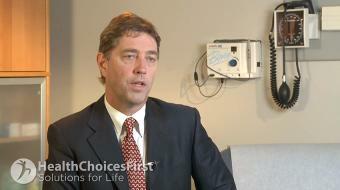 Gout Treatment Options John Wade, MD, FRCPC, discusses gout treatment options. It starts in 20s and 30s in men, usually a bit older in women. And you have to divide the treatment of gout into the treatment of the acute attack and the prevention of recurring episodes of gout. The common treatments for acute gout for medications are non-steroidal anti-inflammatories, the medications that we use for arthritis. These are generally used in much higher doses, so a high dose for a very short period of time; often three or five days is effective. In addition to non-steroidal anti-inflammatories, another common medication that we’ll use is a drug called colchicine. Colchicine has been around for centuries as an extremely effective medication for gout, and it should be used at relatively low doses for a number of days. Many people make the mistake of using the dose at a high dose, and you get a lot of problems with diarrhea with that medication. But colchicine used at a low dose on a daily basis can be an extremely effective treatment for gout. Sometimes, if you have an acute episode of gout, and it’s a joint that is easily accessible, one can sometimes put a steroid injection directly into the joint; small needle, cortisone or steroid into the joint, and that can be a very effective treatment for gout and you don’t need to use oral medications such as anti-inflammatories or colchicine in those individuals. Medications we use to prevent gout can come in two types of medications. So to prevent acute episodes of gout, we can use medications that get rid of uric acid into the urine, called uricosurics. Those medications are not commonly used, but are extremely effective and can be used by giving doses on a regular basis to get rid of uric acid in the blood. A more common type of medication to use is to give a pill daily. The most common uric acid lowering medication is Allopurinol, which has been around for 40 years now, and that medication used on a daily basis will reduce your uric acid level quite effectively and reduce the risk of recurrent gout. There is sometimes a situation where you’re on a prevention therapy – a medication you take daily, and the level of uric acid is not low enough, so you may actually have to go back and treat with the acute drugs, if there’s an acute flair, for a period of time. But eventually over time, if you get the uric acid low enough, you should be able to prevent episodes of acute gout and not need the medications like the anti-inflammatories and colchicines because the episodes don’t happen. So it’s important for individuals to recognize that medications have side effects. Those side effects can be severe, and so one needs to realize that if they’re going to start a medication, they need to discuss with their doctor and their pharmacist whether that medication is right for them.